Fixing a Foundation Problem in Palm Springs. The Before Picture is a prime example of was is termed Mud Jacking. This occurs when somebody attempts to fill a void, caused by shifting soils, with concrete. Over time the foundation continues to settle, and the concrete becomes rough and continues to crack. The After Picture shows this same area. The void has been filled with Polyurethane, using Saber's PolyLevel Injection Process. The cracks will now stop growing. The concrete will not continue to sink. 95% of the baseboards had to be replaced after the rain labor day weekend of 2017. Was up north and came back to baseboards pulling away from the walls. Note, the drywall was not damaged but two rooms had dried silt on the floor. We have refinished concrete floors and find that some water seeps through the slab of our house when it rains. It's not a leak, the house was totally remodeled and plumbing was rerouted through walls and roof. Prep concrete pool deck for Cool Coat application. Looking for information on seismic retrofits for 1970's doublewide. Large crack in middle of two car garage floor front to back , increasing over year or two. Front left of garage floor settling down, Door does not close evenly. Cracks in stucco along garage supporting beam. Condo built in about 1972. No water leak in pipes under garage slab. 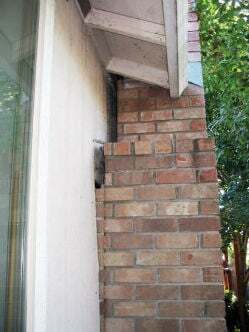 This chimney separated from the house because of foundation settlement. Palm Springs is known for many things, including its mid-century modern architecture. But even its most unique buildings may have to contend with foundation problems. In business since 1987, Saber Foundation Repair has decades of experience helping homeowners in Palm Springs with high-quality foundation repair and concrete lifting services. Does your home have noticeable cracks in interior or exterior walls, sagging floors, bowing walls, or windows that stick? All of these and more can be signs of foundation trouble. The foundation repair experts at Saber Foundation Repair know how to find and diagnose all of these symptoms, so we can fix the cause of the problem. There is no job too big or small for our professionals to handle. Our priority is your complete safety and satisfaction, so we won't rest until the job is completed to our high standards. When you work with Saber Foundation Repair, you're choosing undeniable quality and a permanent solution! Concrete slab settlement can cause major tripping hazards. Concrete slabs can also cause many difficulties for local homeowners. Have you noticed any of the following problems around your home? If so, concrete slab settlement is probably at work. Saber Foundation Repair has an effective, fast-acting solution that will restore your property in no time – PolyLevel! This award-winning concrete lifting and leveling solution uses a polyurethane foam that, when injected beneath a concrete slab, will expand and lift the concrete back to its original position. Along with our foundation repair and concrete lifting services, we can also help with earthquake retrofitting, crawl space repair, and more. If your home has any structural problems, chances are we've seen them before. Schedule a free estimate in Palm Springs, CA today and see how we can restore safety and value to your home! Several cracks in a Concrete slab have caused a uneven floor in a bedroom. There is a Void under the floor. This concrete slab had cracked due to a void that formed under it. Saber filled the void by drilling through the slab and injecting Polyurethane. The crack has stopped spreading. I have 3 areas where the concrete has lifted. There is a sale pending and I need to get it repaired before close of escrow. Substantial crack in slab of home in Palm Springs. I would like to have an inspection, as well as an estimate for repairs. Large front A-Frame roof section has a California Tie-in to main roof and is supported by posts to beams on opposite side. The foundation for one post has sunk approximately 8". Seemingly a simple fix, but a challenge to find a vendor to take on.